I was about to write … this is my favorite holiday cookie … but I think I’ve said that with every cookie recipe I’ve ever shared. Truth is, they’re ALL my favorites. I have so many holiday memories that involve cookie baking with my mom that it makes it hard to narrow down just one favorite. 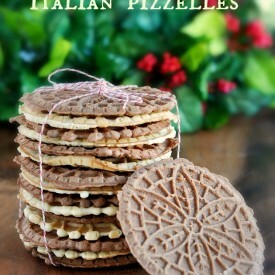 So instead, I’ll just say that making Pizzelles are one of my many favorite holiday cookies. Growing up my mom had an ancient pizzelle iron that I think was new when her mother bought it. I had hopes of it becoming mine one day but let’s just say it got passed on to someone else in the family and is now nowhere to be found. It’s a shame but it is what it is. Fortunately, Cuisinart still makes Pizzelle irons and I scooped one up last year when I was holiday shopping. 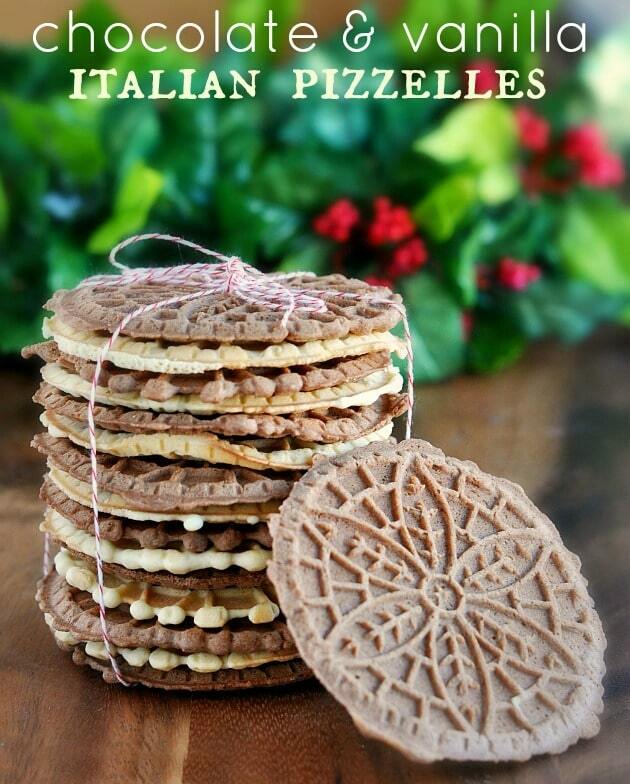 It’s a simple little machine that makes two pizzelle cookies at a time with a unique pattern on both sides. Basically, drop in the dough, close the lid and wait for the light to turn green. That’s all there is to it. In a medium mixing bowl, whisk together the eggs, sugar, vanilla, espresso powder and salt until smooth. Add the cocoa and baking powder, whisk until smooth. Add the flour, mix well then add the melted butter and whisk until smooth. The result will be quite thick. Spray your pre-heated pizzelle iron with non-stick cooking spray and drop about ½ to 1 tablespoon of batter into the center of each iron. Cook according to manufacturer's directions. It takes a few tries to figure out the right amount of batter.